Extending living space into the outdoors is a burgeoning trend that has really picked up steam in the last five to seven years. The everyday back patio slabs with lawn chairs and a cheap grill are no longer going to cut it in the high style world of outdoor living. Today’s porches have gas fireplaces, stone, and woodwork encapsulating the area and probably a wet bar and a substantial grilling option in the outdoor kitchen. When further examining these trends in outdoor living, there seem to be two schools of thought for the best uses of outside spaces. By expanding current interior rooms and adding doors or removing walls, homeowners are bringing in what the outside has to offer. Some want to proceed as naturally as possible, extending an existing space, such as the living room or kitchen, out into the attached yard. The style and colors of the room will flow outside to encompass the porch. A traditionally styled home might use stone columns, wooden ceilings, and fireplaces with a big screen TV mounted about the mantel to mimic the living room inside. But, a cottage influenced home will extend its space with items on the deck such as white wicker or rattan inspired furniture. Others will maintain a separate and obvious look from the inside room leading outside. Although an easy pass through such as French doors may lead out onto the patio, the styling outside is very different. A transformation of atmosphere will occur as you leave the main house. For example, owners of a mid-century modern home may have fond memories of lakeside retreats during summers of their childhood and want to recreate a wooded cabin feel for their outdoor living space. Beach themed porches accentuated with colored chairs, woven mats and maybe a custom-built sandbox are always popular choices. So how do you achieve either of those options? It’s time to round up the concepts described in previous Find Your Style posts and apply them to the outdoor living space. Your stage in life will help to set priorities. Ask yourself, do I plan to use the porch for neighborhood cocktail parties monthly or will it be a place to feed kids popsicles and play on the water table? Will I use the porch each day with coffee in the morning and a grilled dinner in the afternoon, or just relaxing on the weekends? Remember, weather will come into consideration. Owners living in temperate climates will have more year-round time to spend outside, but those in cooler regions may invest less because quality time outside isn’t as long. The amount of time owners plan to live in the house is a huge deciding factor. A large investment would likely indicate a lengthy stay. If the money isn’t there to add a $50K porch to extend your family room, choosing pieces for a less expensive patio will be the next consideration. There are plenty of options out there, from a casual set for a couple hundred dollars to investment pieces ranging in the thousands. 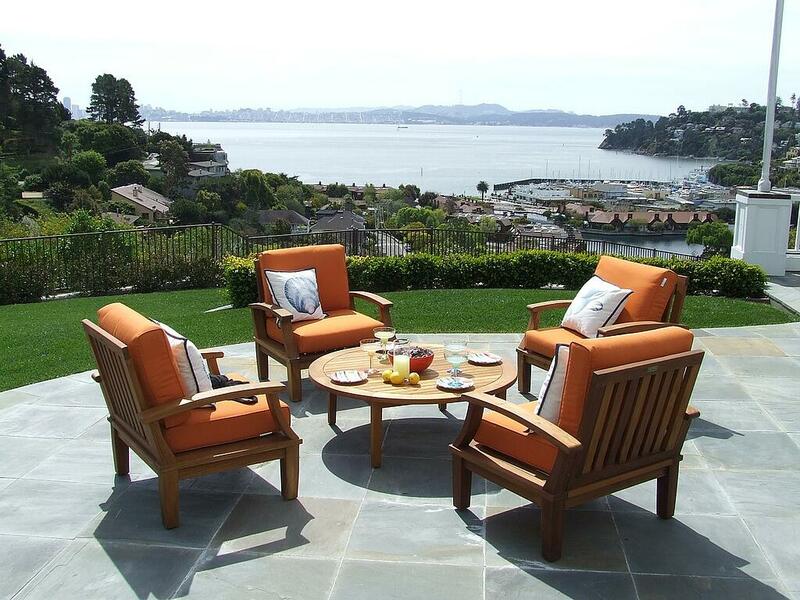 Correct scale and proportion sizes might be tricky when selecting outdoor furniture. The eye will wander naturally and it’s helpful to have points of reference to frame a "room" outside. Large, colorful umbrellas will produce a ceiling effect, especially if they are used in multiples. Outdoor rugs offer a grounding visual and arranging seating into conversation areas will proportionally divide the space. Weather resistant screen dividers are also helpful. The sky is limit! Go crazy, go bold, go vibrant! Or decorate with calm, serene, and nature inspired hues. It all works if done cohesively. Choosing a theme is an easy way to add color. If you are simply extending an existing theme into the new space, your template is already there to enhance. If starting fresh, color can be injected with any theme imaginable. "Bollywood" multi-color and glamour, industrial edge with metal finishings, resort spa tranquility, or a Mexican fiesta patio complete with edible salsa garden are just a few options. 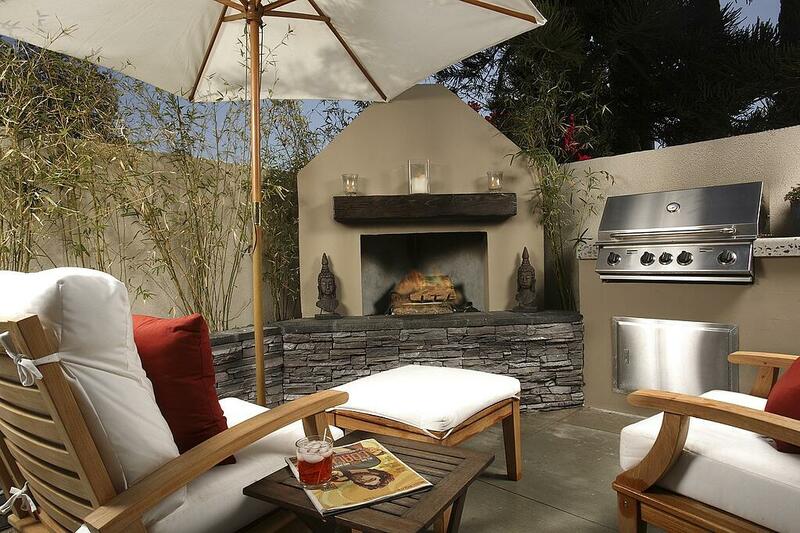 Outdoor living is an exciting way to take advantage of open space, while adding your personal style along the way. Need more home decorating tips like these? Click below!